Filice, Michelle. "Indigenous Services Canada". The Canadian Encyclopedia, 01 November 2018, Historica Canada. https://www.thecanadianencyclopedia.ca/en/article/indigenous-services-canada. Accessed 20 April 2019. Indigenous Services Canada (part of the former Indigenous and Northern Affairs Canada or INAC) was created by the federal government in 2017 to provide and support the delivery of services such as health care, child care, education and infrastructure to First Nations, Métis and Inuit communities. The overarching vision of the department is to support self-determination as a means of providing Indigenous peoples with the power to deliver their own services. 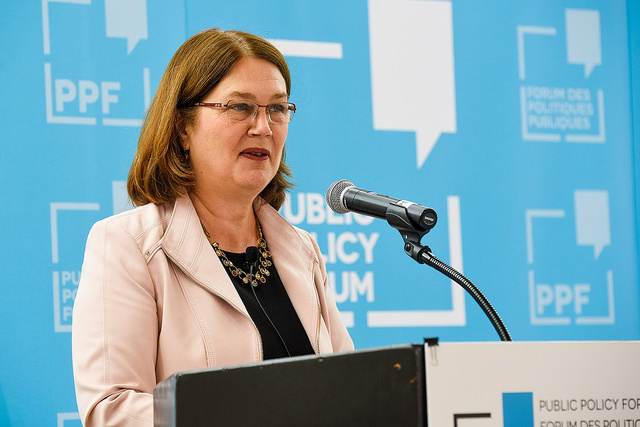 Jane Philpott, the first Minister of Indigenous Services Canada. Pictured here at the Public Policy Forum conference on 27 September 2017. The conference focused on reconciliation and strategies for implementing the Truth and Reconciliation Commission's health-related Calls to Action while building a healthcare system of cultural competence for Indigenous inclusion in Canada. Crown-Indigenous Relations oversees Indigenous-government relations, including matters pertaining to treaty rights and self-government. Indigenous Services works toward improving the quality of services delivered to Indigenous peoples, with the eventual goal of having these services delivered by Indigenous communities rather than the Crown. Indigenous Services has also taken control of the First Nations and Inuit Health Branch, which was transferred from Health Canada	to the new department in 2017. The first minister of Indigenous Services Canada was Jane Philpott. Indigenous Services Canada is responsible for improving access to services for First Nations, Métis and Inuit communities, and to support self-determination as a means of empowering Indigenous peoples to eventually control the delivery of services in their community. The department aims to move forward with this mandate in partnership with First Nations, Métis and Inuit peoples, while also recognizing the differences among these diverse communities. Indigenous Services outlined five priority areas of its 2018–19 agenda: improving health outcomes, quality education, family	and child welfare, infrastructure, and developing a new fiscal relationship with Indigenous communities. Supporting culturally-appropriate curricula and Indigenous-led schooling is part of the department’s second priority to improve education services in Indigenous communities. (See also Education of Indigenous Peoples in Canada.) The department also seeks to improve family and child welfare; in 2018, the federal government allocated $1.4 billion over six years to support Indigenous children and families. Building a new fiscal relationship with Indigenous communities is the fifth goal. The department seeks to provide long-term funding solutions as well as to support Indigenous-led services and the creation of fiscal relationships based on mutual accountability. 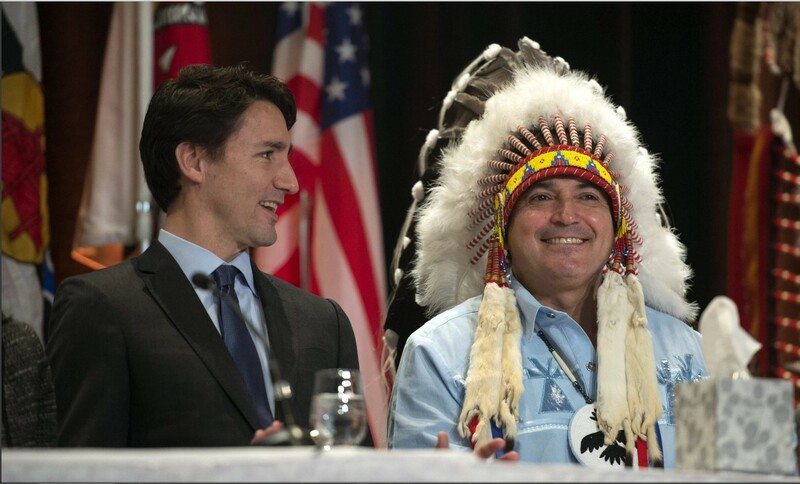 MANDATE LETTER Read Prime Minister Justin Trudeau’s mandate letter to Dr. Jane Philpott, the Minister of Indigenous Services Canada (4 October 2017). INDIGENOUS SERVICES CANADA Explore the official website of this federal department.